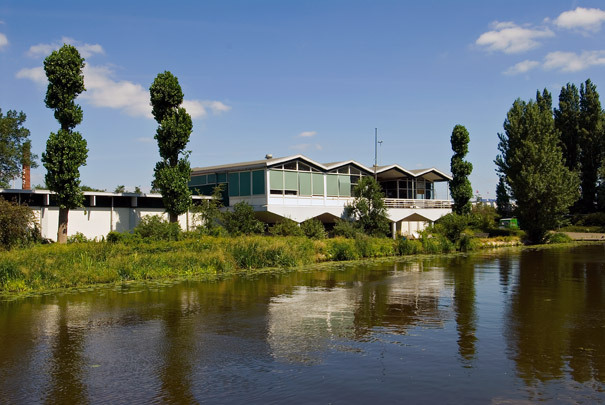 This clubhouse for the Skadi rowing association occupies an isolated position between the motorway and the Noorderkanaal. The elongated building has changing rooms, storage space and boat sheds on the ground floor with the almost fully glazed club room upstairs. The mansard roof and corresponding shape in the basement are inspired by the form of a ship. The building as a whole is informed by the contrast between transparent and opaque facades and by its dainty structure. Two slender steel spiral stairs lead from the club room balcony to the landing stage.